Travel with Kevin and Ruth! : Sherman needs a bath! For those of you who don't know, Sherman is the name of our motorhome. Sherman has been parked here at Hacienda Contreras RV Park near Valle de Juarez, Jalisco, Mexico. He's been been parked here since April 1st of 2013, almost one full year without us! He was sure happy to see us yesterday. And we were happy to see him! Two things we were worried about...mice, and water leaks. But everything was good! Just as we had left him. No indication of either of those things. The poor guy was covered in dust though, and a lot of black steaks down the sides caused by the residue from the rubber roof. I checked the batteries. They were fine, but are almost in need of some water. They didn't get used, and I left everything from the solar panels hooked up. No problems there. Need some air in a couple of the tires. And the engine battery was almost flat so I put a trickle charge on it last night. Hopefully it's fine. We got everything back into place and our things put away. Sure was nice to sleep in our own place again! One of the problems is that they're doing long awaited repairs on the road out front and it's causing lots of dust. I rinsed the roof off and cleaned the solar panels, but the roof still needs a good scrub. No point in doing that here because it will just get covered again. I will do it over the next couple of weeks at some point though. Even with that layer of dust on the panels there was still 6.0 amps going into the batteries. After cleaning them, there was 14.0 amps going in! Kevin, scrubbing the dirt off. I purposely increased the contrast on this pic so that you could see the difference! Only got the one side and the back done. The rest can be done today! From left, Jerry, Uli, Heinz, Pete, Madeline, Kevin, Ruth. Paula took the picture! Ruth, Paula, and one of the local pets. Barb and Sal opened up this RV park about 7 years ago. Everything was going well until last year when the property next door was purchased with the intent of opening a Pemex gas station and truck stop. Construction began, and with the noise and dust and a huge wall going up between the two properties. It wasn't what Barb and Sal had envisioned for this RV Park and there were regular squabbles between the two neighbors. Eventually, Sal told the owner of the gas station "why don't you just buy my property too?" And somewhat surprisingly, the guy made an offer that Barb and Sal couldn't refuse. Part of the deal included Barb and Sal returning as campers this year, but with the offer of helping the new owner run the park. That obligation is now over. The Pemex gas station is nearing completion and with the noise and the lights and the huge wall separating the properties, Hacienda Contreras isn't what it used to be. There were several regulars that came back this year, but what will happen next year remains to be seen. After the deal was made, Barb and Sal helped Sal's cousin Chema open up 10 RV sites behind his restaurant just down the road. They are full hookups, and we're going to go over there on Saturday with Sherman and test the waters for a couple of nights. We'll report back on our findings, but we have a feeling this will become our new go-to RV park in the Valle de Juarez area. We can't believe what great shape he is in other than being filthy dirty on the outside. Sure is nice that you are back home with Sherman getting him all cleaned up. Then of course those "Happy Hours" you have been missing. He may not end up all shiny but he will be clean and he'll feel so happy and loved again. The "Happy Hours" sure are fun. I vividly recall doing those spring cleanups after letting our Class A sit all winter. It would take me the better part of a couple days, with a certain amount of evaporated time thrown in of course. Kind of good news on the fate of the park, or at least for Barb and Sal. Good to see they came out ahead. Now you can go and check out the other place and see what that's like. Yep, it will take us a little time for sure to clean him up. Luckily on the inside it is mostly just a bit of dust so my (Ruth's) job is much easier than Kevin's! We will certainly miss Whiskey's tree but as long as the park itself stays open we can always walk down the road and visit her and her tree. 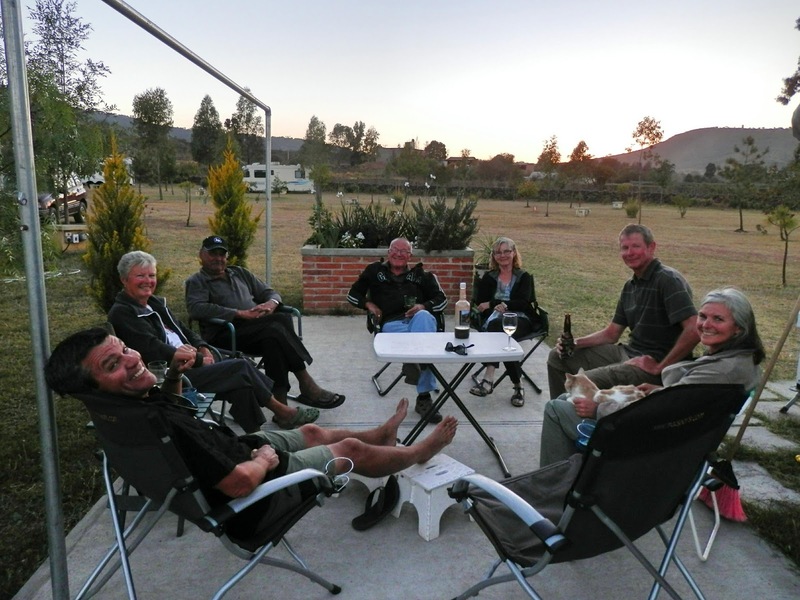 We are so happy that Barb and Sal are going to go and do a bit of traveling themselves but we sure will miss Hacienda Contreras and them. How many critters moved in while you were gone? Sherman sure does look happy! Nope, we knew that it was under there! We think that Chema's will be another good spot for Valle de Juarez, a little smaller but closer to town. Can see Sherman is going to scrub up really well. Reckon you have been really lucky not to have any storage problems and long may it continue. He certainly does scrub up well and yes, we were very lucky not to have any storage problems. Hopefully this will continue over the summer as well!